The Tiffen Series 9 85 Linear Polarizer Filter combines both an 85 color conversion filter with a linear polarizing filter to blend the effects of both filter types into a single, convenient solution. The 85 color conversion aspect of the filter provides a warming effect and decreases the color temperature from 5500K to 3400K, allowing the use of tungsten balanced film in daylight conditions. 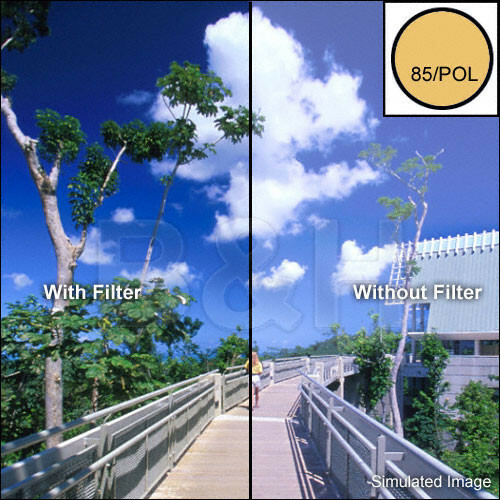 The linear polarizing aspect of the filter helps to reduce reflections and glare by filtering out light that has become polarized due to reflection from a non-metallic surface. This results in a noticeable increase in the saturation of skies and foliage, as well as clearer imagery when photographing in hazy conditions. A linear polarizer differs from a circular polarizer in that it does not supports use of a camera's autofocus or auto exposure functions; it is best suited for use with manual cameras, such as view cameras, that are not dependent on internal mechanisms to determine focus or metering settings. There is a total filter factor of about 6x, requiring an increase of 2.6 stops for normal exposure. Tiffen filters are made using ColorCore technology, a process that involves laminating the filter substrate between 2 pieces of optical glass, grinding flat to a tolerance of 1/10,000th of an inch, and mounting to precision metal rings. This filter is compatible with Series 9 filter holders. Linear polarizer and 85 amber color conversion filter combination. Total filter factor of approximately 6x requires 2.6 stops of additional exposure for normal results. Warming 85 color conversion filter decreases color temperature from 5500K to 3400K for using tungsten-balanced film in daylight conditions. Polarizer helps to reduce reflections and glare by filtering out light that has become polarized due to reflection from a non-metallic surface. Strongest polarizing effect when used at a 90° angle from the sun.